Diary of an Aspiring Loser: Triathlon, Oh How I've Missed You. This is going to be a quick post. I'm sitting in a conference room waiting for a 4-day intensive CBT training to start. That means this might be my last post for the coming week. The week has been stellar so far, though it's only Tuesday morning so that helps. But my motivation is high, which always makes everything easier. 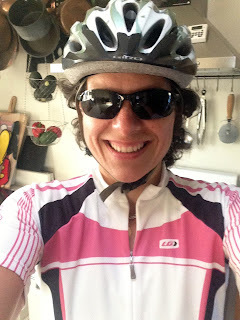 Yesterday I went to the gym after work, doing my strength training routine - back/biceps/PT exercises - before heading home and getting on my bike for the 5-mile ride on my training plan. I had hoped to finish up the ride before dinner but in the end I got home just when dinner was starting so I knew I'd miss it. Miguel was very supportive of my getting the ride done, he knows I'm pushing to get some traction with my training plan. I hopped on the bike and because I was so pressed for time I didn't take any of my normal "stuff" - no Garmin, no heart rate monitor - nor did I remember to take the basics, like water. But I was only riding 5 miles so I was fine. So I'm on my bike heading down the street, wind in my hair, feeling like I'm gliding when I thought, "Oh triathlon, how I've missed you." I do enjoy running but man have I missed the multi-sport. It's just so fun! I guessed on a route that turned out to be 5.4 miles - perfect! Back home and I had dinner - red beans and eggs. I was still hungry so I munched on this and that as I made the kids' lunches. There was a huge bag of Kettle chips leftover from camping last weekend. Despite not being my favorite I found myself repeatedly dipping in them. So I wrapped them up and put them in Miguel's trunk outside. That did the trick. 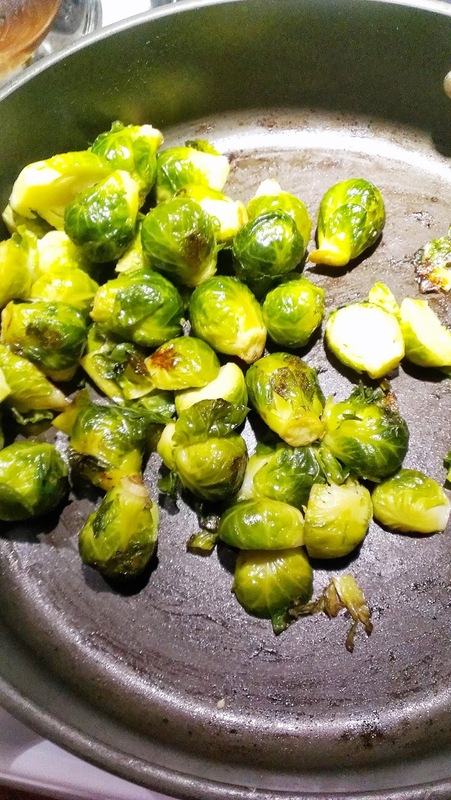 I had some brussells sprouts that were starting to wilt so I cooked them up and they hit the spot. About halfway through trimming off the ends I got frustrated and just threw the rest in. Turns out the ends cook up just fine and I hardly noticed they hadn't been trimmed. I might be eating more brussells sprouts in the future because the trimming sometimes stops me from buying them. Yay! After getting the kids' lunches done I started in on my own food. This 4-day training is likely going to involve some "bad" snacks and I don't want to be hungry and at the mercy of conference food. So I packed an apple and Greek yogurt for my morning snack and a string cheese and sliced turkey breast for my afternoon snack. And I made a commitment to myself to skip the provided snacks. Lunch is also provided and barring fried twinkies being the entree, I'll be eating the served lunch. Today's schedule goes until 9pm so I likely won't be getting any exercise in, though I did pack some running clothes just in case the opportunity presents itself. Ok - the conference is getting started so I have to run...have a great week! Ack! Conferences are the WORST! Been meaning to thank you for your post (on Facebook I think) recently about stopping into the grocery store for yogurt / apple / banana when I'm desperate for a snack. I have always traveled quite a bit for work, but it used to be it was always airline travel. My strategies for surviving a week on the road have NOT been panning out in my new job where mostly I'm traveling within driving distance, spending sometimes 3-4 hours in the car each day. I had just been (listening to the half-size-me podcast and) thinking "I need to develop some new Travel Survival Plans" when I read your post. Sounds like a fun ride! I Jove triathlon too -- even though I mostly do the sprints. no "even though" about it - sprints are super cool!! Hey I hope your conference isn't too boring and good job on exercising. Keep up the good work! it was anything but boring and thanks!! I did one triathlon, and while I loved it, the swimming part scared the bejesus out of me - you can't put your foot down in a lake! I'll stick to a run or I am still looking at doing a duathlon of running and biking before the summer is out. I've just begun my "weight loss journey" and I stumbled upon your blog! I've already bookmarked it to keep close by for advice and encouragement! I'm also blogging about my journey, hoping to keep myself accountable! It's new, but here it is: www.mythreesixfiveblog.blogspot.com. Comments, advice, and encouragement is welcome!!! Welcome Gini - best of luck on your weight loss and blog journey!! For proper triathalon training, one would think that he or she would have to start running, biking and swimming a lot, every single day.